Data center networks every so often use compactly interconnected topologies to deliver high bandwidth for internal data exchange. In such network, it is precarious to employ effective load balancing schemes so that all the available bandwidth resources can be utilized. In order to utilize all the available bandwidth traffic need to be routed across the network instead of overloading a single path. Equal Cost Multipath (ECMP) enable the usage of multiple equal cost paths from the source node to the destination node in the network. The advantage of using this algorithm is that the traffic can be split more uniformly to the whole network avoiding congestion and increasing bandwidth consumption. This blog explains hash based ecmp load balancing algorithm. ECMP load balancing refers to distributing traffic more evenly by installing entries for multiple best paths to the switch’s forwarding layer and using load balancing algorithm to identify flows and distribute them to different paths. If number of flows is large this algorithm helps in distributing the traffic along with other unused paths in order to reduce the congestion. ECMP implementation enables us to evenly spread flows across the network leading to best utilization of multiple links towards the destination. It reduces the time taken in data transfer up to large extent due to less congestion. This algorithm helps us in improving network performance in SDN enabled networks. An example of ECMP load balancing is shown above. 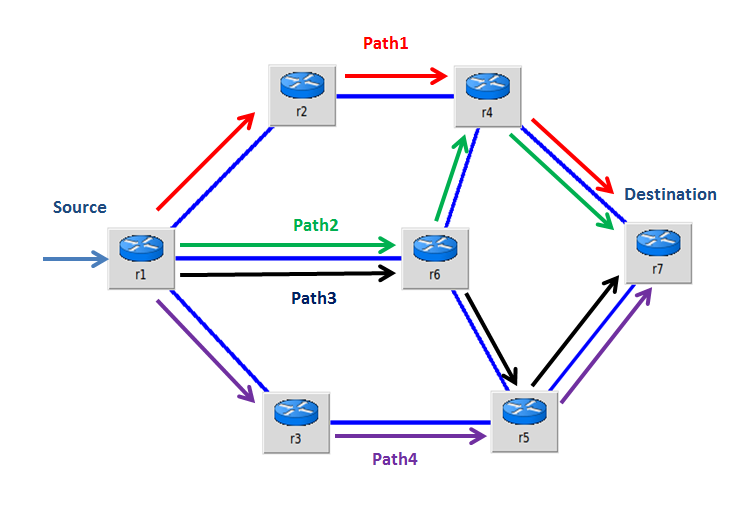 Here four equal cost paths are available to route the packet to destination. With use of ECMP algorithm all four paths are getting utilized to route packets. This helps in distributing traffic evenly across the network and reduces congestion. Additionally, these four ECMP paths are backups for each other. If one of the paths fails, traffic could be split between the other three paths after failure detection. address (i.e. multiple paths have the same cost metric), the controller installs rules in switches in such a way so that all the paths to reach that MAC address are utilized instead of overloading a single path. This is accomplished by identifying rules that match on more fields in conjunction with the destination MAC address. This algorithm finds all possible shortest paths to reach the destination and perform modulus operation on the hash value with number of shortest possible routes and select the final path based on the output. 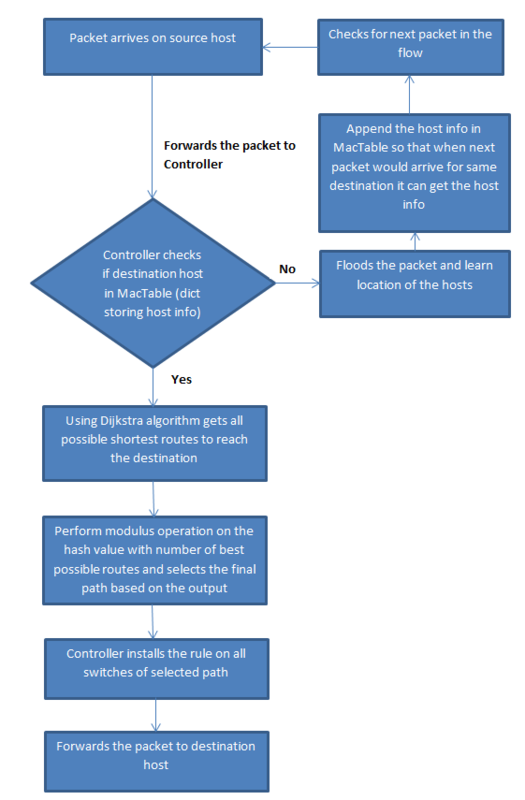 Once final path is decided controller installs the rule on all switches of selected path and forwards the packet to destination host. This implementation has been categorized into two steps. graph and stored as an adjacency list. All edges have equal cost. This algorithm computes the weight of the path where weight of the path is sum of weight of constituent edges and returns paths with minimum weightage. This gives us all possible shortest path to reach the destination. Here is the algorithm to compute all shortest path from source to destination. on all ports except the one it came in and learns the location of the hosts. We populate dictionary with this entry so that next time when packet for that destination arrives instead of flooding all ports we can just send to the appropriate port. This is based on backward learning concept. Next packet in the flow will follow the above mentioned logic and ECMP forwarding rule will be installed for the flow. paths exist in the forward and reverse path direction for given source and destination. 5 tuple hash for packets, otherwise 0. We perform modulus operation on the hash value with total number of best possible routes. The output of this modulus indicates which of the paths to use. This algorithm has been depicted well with flow diagram shown below. This algorithm helps in reducing congestion in network. Due to less congestion it would also help in reducing the time taken in data transfer. Also with use of this algorithm network performance of shuffle phase data transfers in Hadoop MapReduce can be enhanced.